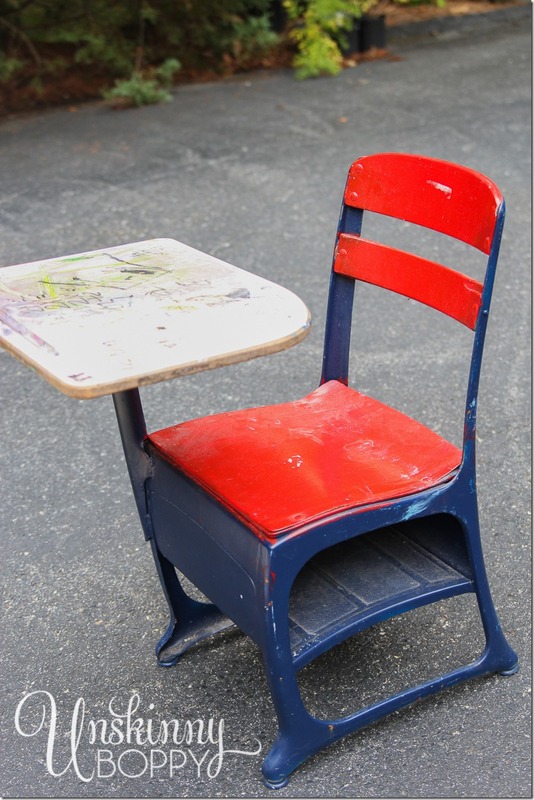 I keep seeing these vintage student desks popping up all over thrift stores and antique malls these days. Prices vary, depending on the condition and age of the piece, but we picked up this cute little metal guy for $30.00. I was actually shopping with my parents when my dad spotted the desk. He started reminiscing about his school days spent studying in a metal desk exactly like this one, so I’m going to guess the age to be a mid century piece, since that is when my dad would have been in school. 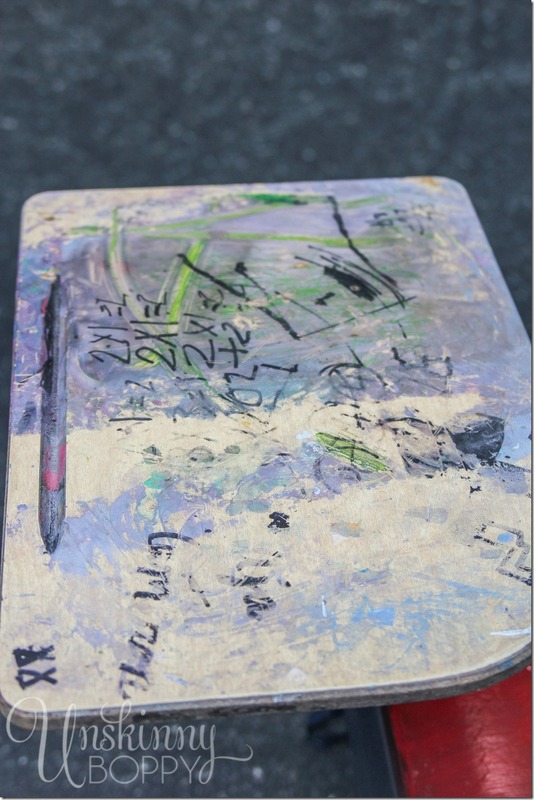 The top of the desk was covered in paint, marker and years of kid-filth. It was pretty disgusting. I was worried it would need to be painted, but after I gave it a good scrubbing with a Mr. Clean Magic eraser it came completely clean without any sign of damage. Thank you, magical Magic eraser. The first thing I did was spray paint all of the metal base a bright Kermit green color. Of course I totally forgot to snap a photo of this step since I was being eaten alive by mosquitos in my driveway. So, we are just going to skip right to the middle part, where I had completely covered all of the green metal parts of the chair (after letting the paint dry overnight). 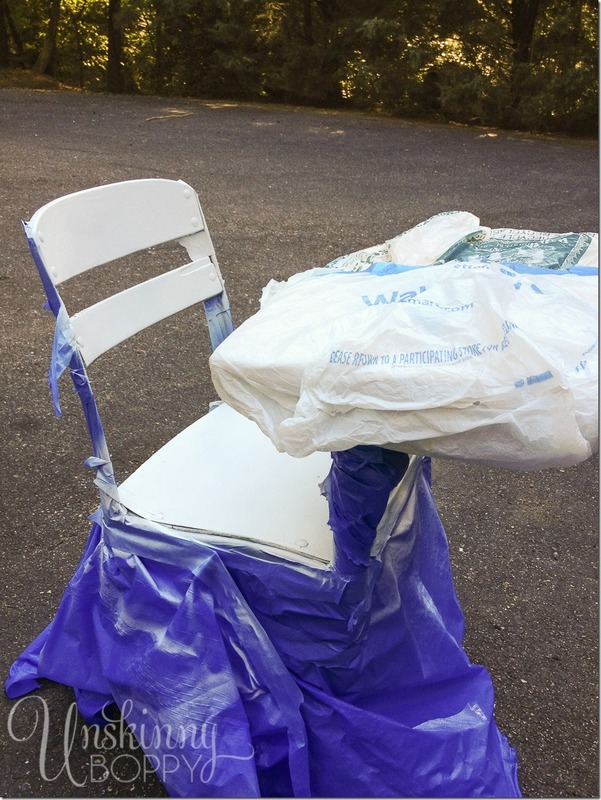 Next up came a coat of white spraypaint for the seat and back. Then I let that coat dry completely. 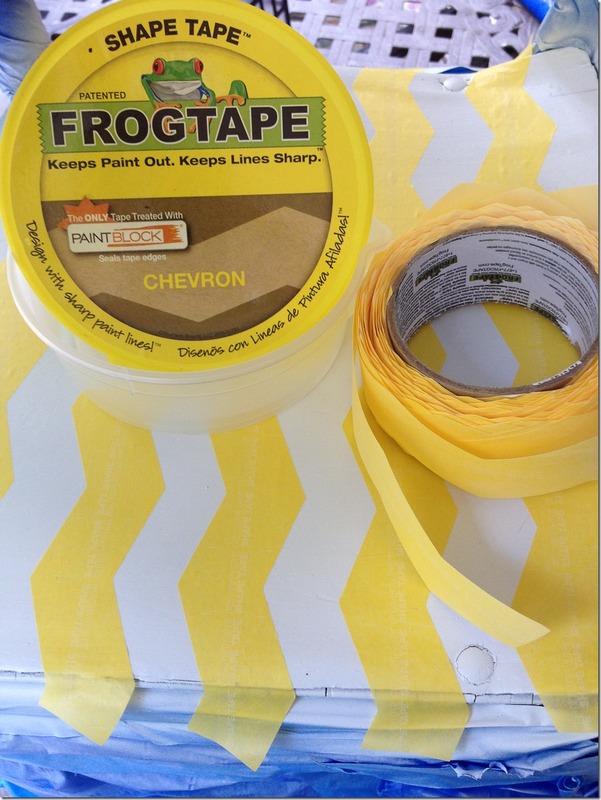 After that, I whipped out my Frogtape Chevron Shape Tape that we received in our awesome Haven Conference Swag bags. Everyone was going crazy over this stuff! I eyeballed the tape and slapped it across the seat and the back all the way around. The curved seat back was a little tricky to keep a straight line, so I cut the tape in the middle and used two pieces to get the angle. Easy peasy. 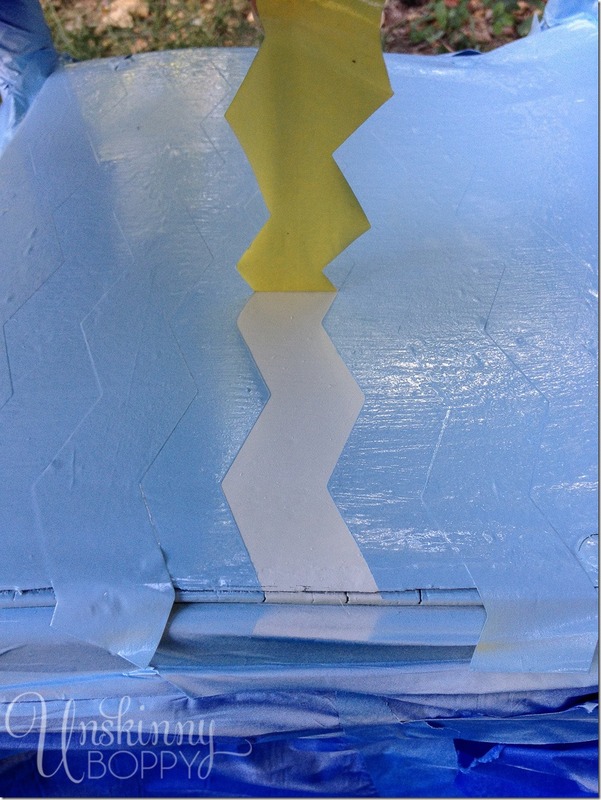 Final step was this last coat of light blue spray paint on top of the whole she-bang. I made sure everything was completely coated, then I pulled off the tape before it was able to start drying. Ready to see the before and after?? Here you go! I’m super happy that the top was able to come clean without a coat of paint. The maple color looks so great with my other happy lime green, light blue and white spray paint choices! And check it out! I showcased my vintage student desk makeover over on Answers.com last week. Afterwards I took the desk to my parent’s house so that the grandkids could have a fun place to sit and work on art projects in Grandma’s beautiful scrapbooking room! 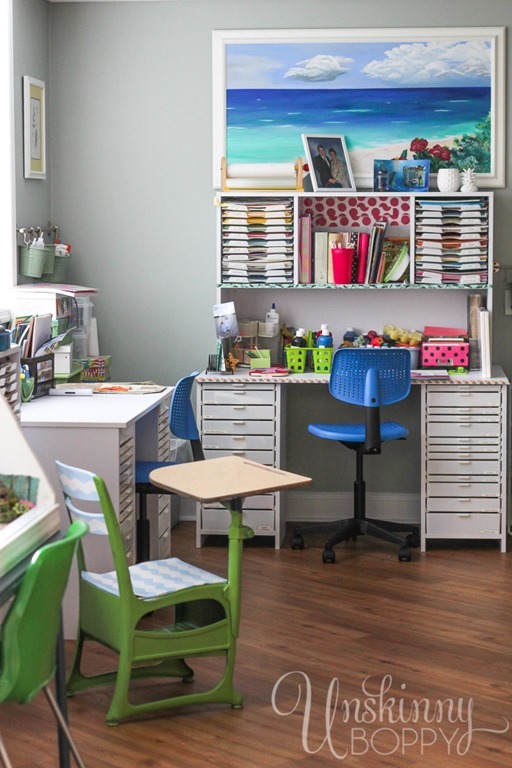 This room deserves an entire blog post unto itself, so be sure to take the full tour of The Most Amazing Scrapbooking Room You Ever Did See. See? I told you it was awesome! This turned out too cool! I love the colors and the touch of chevron – bringing that chair into the 21st century in style. That is just too cute! They still had those desks when I was in elementary school in the 70’s (I’m a smidge older than you, I think ;)) I love your makeover. 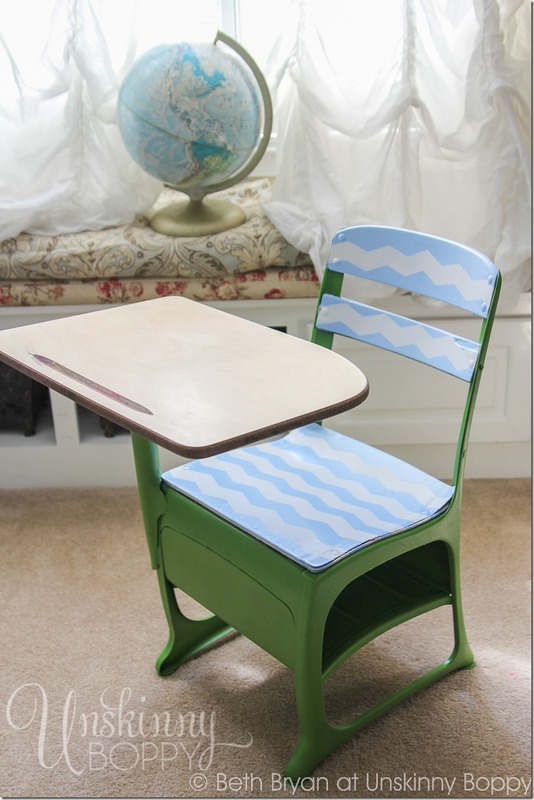 It would make a great homework desk, too! You got it Marty! Thanks so much for asking me! I found this on Pinterest and I must say you sucked me in with your caption “You’ve gotta see the after”. 🙂 Super cute! Welcome!! So glad you hopped over to take a look! cute desk! I love the color combo. I am so jealous of your mom’s room right now. The floors look amazing too! 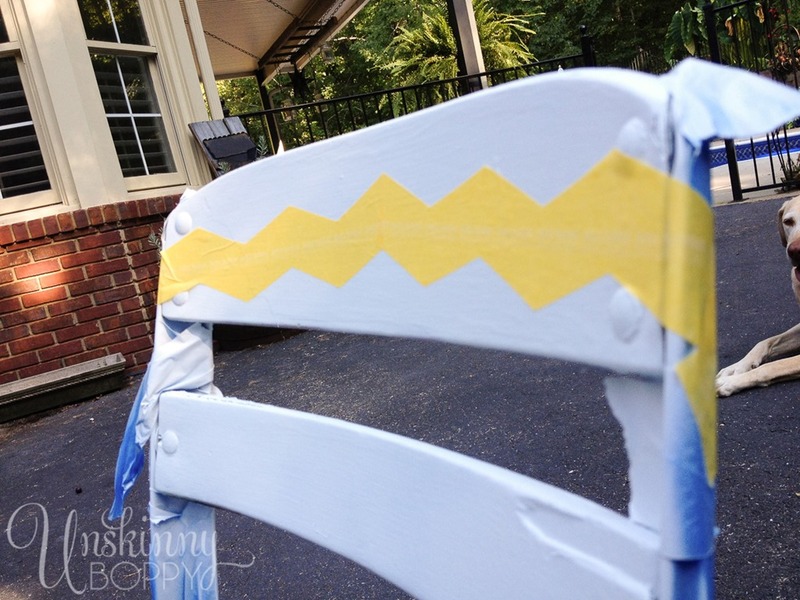 Amazing redo and how insanely awesome is that tape?! Oh cute! 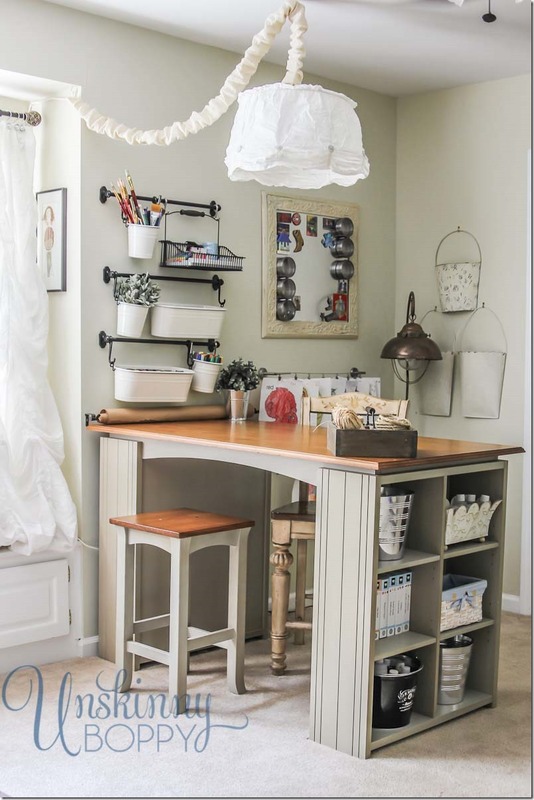 I’ve got a desk exactly like this I’ve been mulling over what to do with. I love the green color you used! WOW Beth, did that come out nice. I’d have walked by shaking my head, it cant be saved. that thing was outright obnoxious. Now its subtle and soft. GREAT JOB. 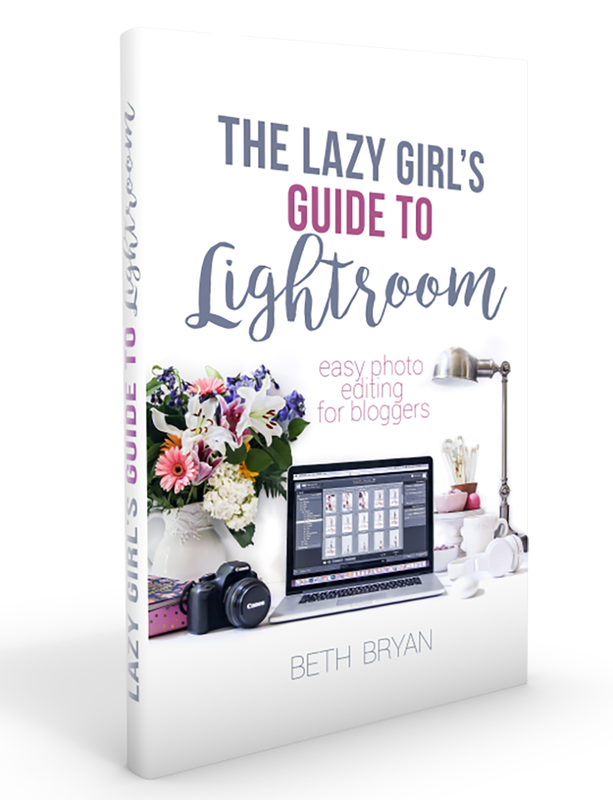 revisiting this post, I just noticed something… your narrow drawers are SO perfect. where did you get those!? Hi, how can i get this product sent to NSW Australia. I paint using ASCP, Would love to purchase but cant find a supplier that will post to me. Can you help!! I just happened upon the amazing looking desk. I have a similar piece but without no desktop. I would love to have an outline of the desktop so that I could refinish the one that I have for my grandchildren. I used a desk similar to this when I was in primary grade and would make a nice conversation piece to share some of my school days with them. Can you help me.